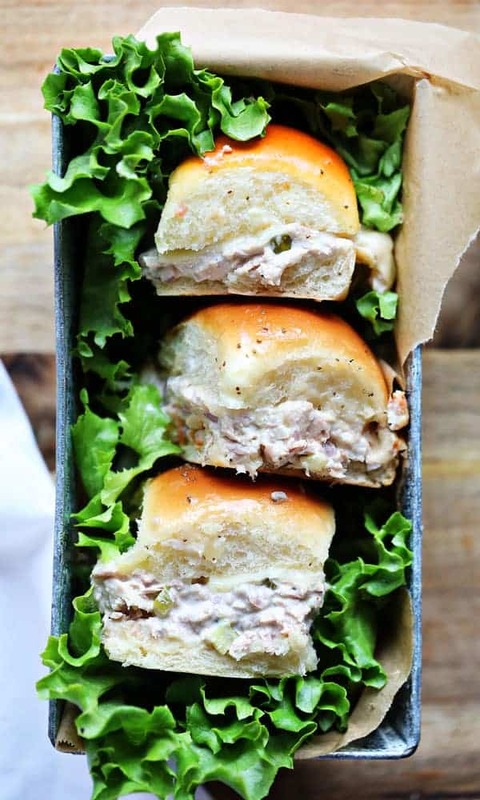 Tuna Sliders are the perfect addition to any dinner table. They are small enough to be an appetizer, large enough for a small meal, and delicious any time of year. Toasted Sweet Hawaiian Buns pair perfectly with the savory tuna salad mixture and the oh so creamy, melted Havarti Cheese. 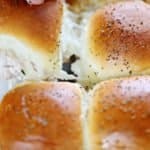 If you like these sliders, you have to try my French Dip Sliders too! The idea for this recipe came from my open-faced tuna melt recipe. 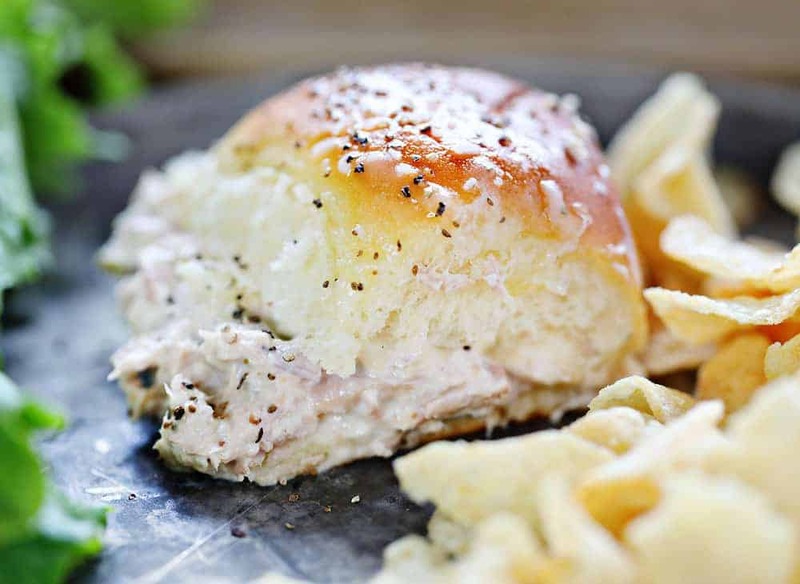 When we made that, we thought that a sweet roll would compliment the tuna salad recipe nicely. Oh, boy were we right! We used Kings Hawaiian Buns because they have that sweet flavor that we were looking for. 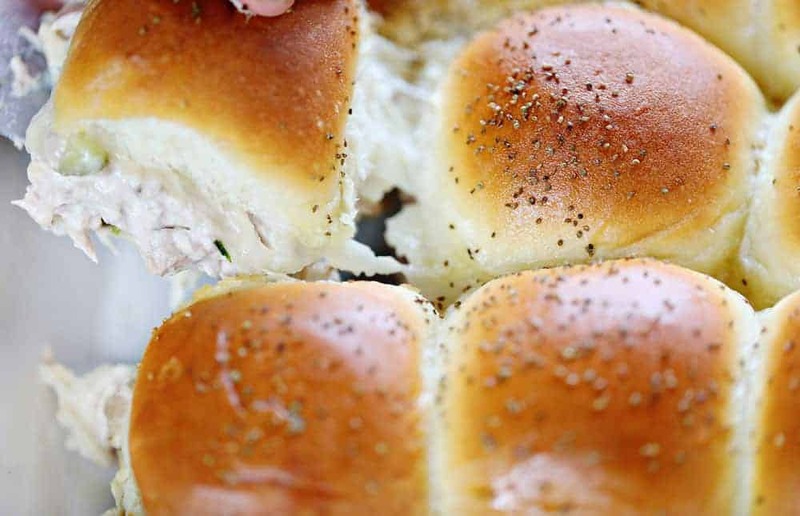 Another alternative would be to use our homemade Amish potato dinner rolls! Served alone, with a bag of potato chips, or a with a cup of the best ever homemade tomato soup, these sliders are a sure-fire crowd pleaser. The entire dish is put together in just minutes and can serve up to 12 people in one setting. That is assuming that everyone just has one. Depending on how you plan to serve these, you could double the recipe to make sure you have enough. I promise they won’t last long! 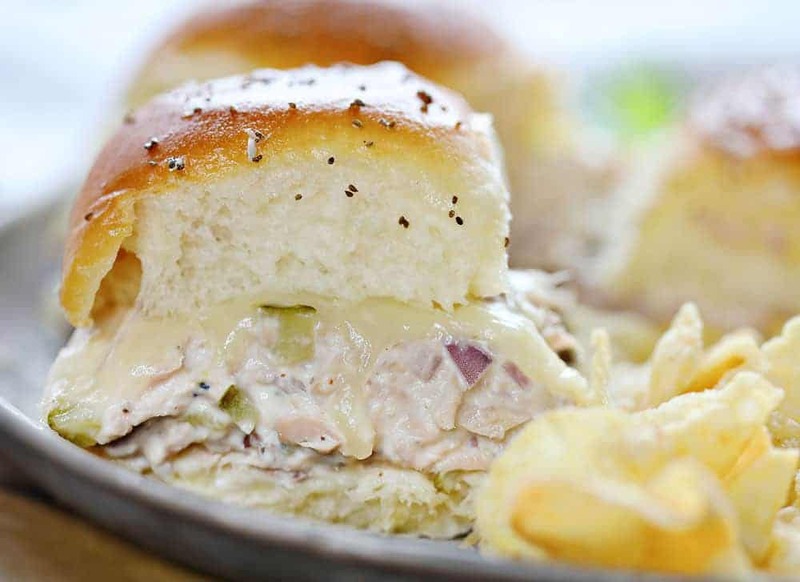 The best thing about tuna melt sliders is how easy they are to prepare. 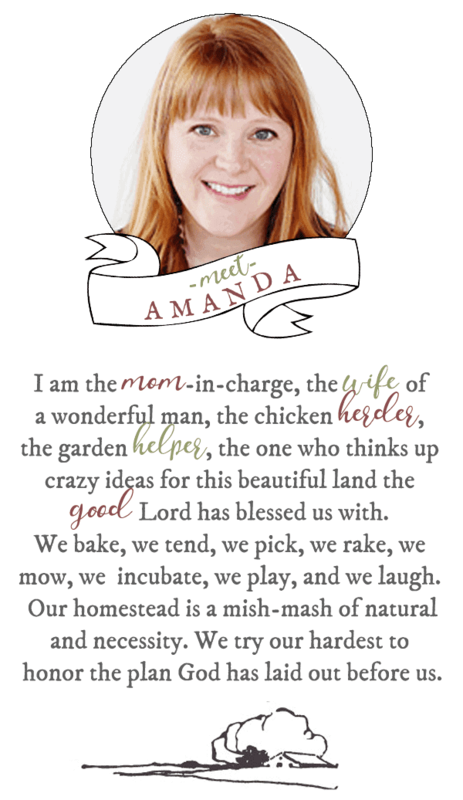 Chop, mix and bake! Start by chopping up your pickles, garlic, and shallots. Add them to a medium bowl and then mix together the remaining tuna salad ingredients (tuna, mayo, celery salt, lemon juice, salt, and pepper). Be careful with the seasonings, this dish can get a little salty if you get too generous in your measurements. I like to err on the side of caution and taste a small bite before I add more. Next, take your Hawaiian Dinner rolls and cut the whole loaf in half. Do not tear apart the individual buns just yet. This will make the assembly and the baking process much easier (and its also kind of fun at the end to tear them apart!). To cut the rolls, place one hand on top of the loaf, and then, using a sharp bread knife cut through the center, removing the top half of the rolls. Set that aside, for now, we will come back to this in a second. Place the bottom half of the dinner rolls in a baking dish. Spread the tuna salad mixture over the top of the buns, add the Havarti Cheese and then top with the other half of the buns. Finally, brush on the melted butter and sprinkle on the celery seed. Cover this with tinfoil and pop it into the oven for about 15 minutes. Remove the foil and bake for another 5 just to make sure the cheese is melted through. That’s it! 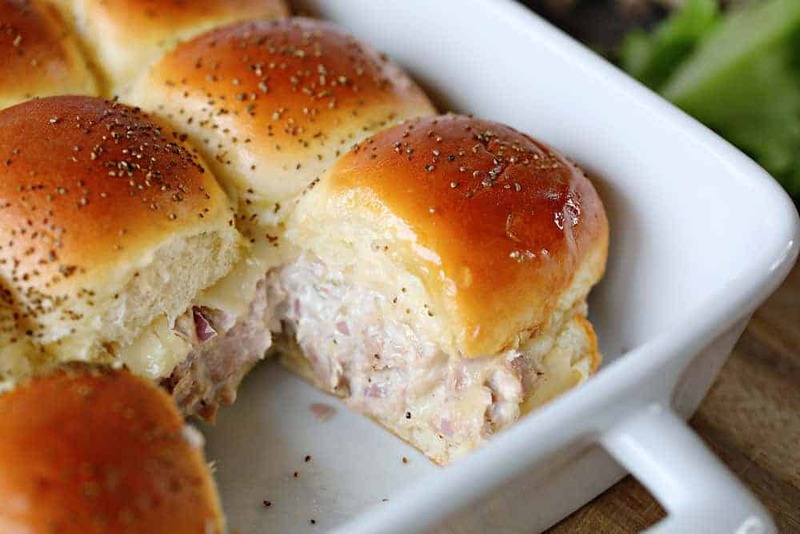 Set the pan on the table and watch the tuna sliders disappear before your very eyes! In a medium bowl combine tuna, mayonnaise, celery salt, shallot, pickle, lemon juice, garlic, salt, and pepper. Split your rolls in half, place one half in the bottom of a 9x13 baking dish. Top the buns with the tuna mixture and the slices of Havarti cheese. Place the top half of the rolls on top of the tuna and brush the rolls with the melted butter. Sprinkle with celery seed. DID YOU MAKE TUNA MELT SLIDERS? They look amazing. Where can I get those buns? Can’t wait to try this recipe. Fantastic recipe! I made this tonight with coleslaw and it was a perfect combination! The only difference I made was using relish (about 1-2 teaspoons) instead of dill pickles, simply because I couldn’t open the pickle jar. I found it added a nice, sweet flavor, and would make the recipe again with relish. Additionally, I doubled the amount of shallots, and it was delicious! I didn’t have much patience, so I baked the tuna melt sliders for 10 minutes with foil and 5 minutes off. However, I wasn’t able to get the Havarti cheese completely melted in the middle, so if someone else would like that satisfying cheese pull, I recommend baking for 15 minutes (as the recipe calls for 10-15 minutes). Thank you for this recipe! I will definitely make more of these sliders in the future!